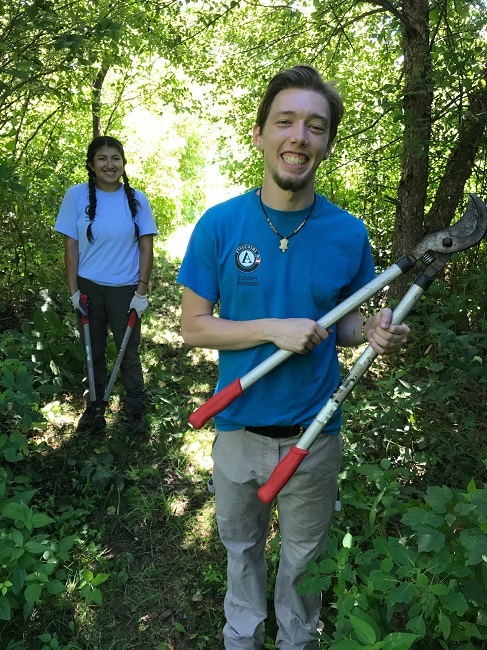 Two teenagers in Summer of Service do hands-on work to help the Earth and find it life changing. 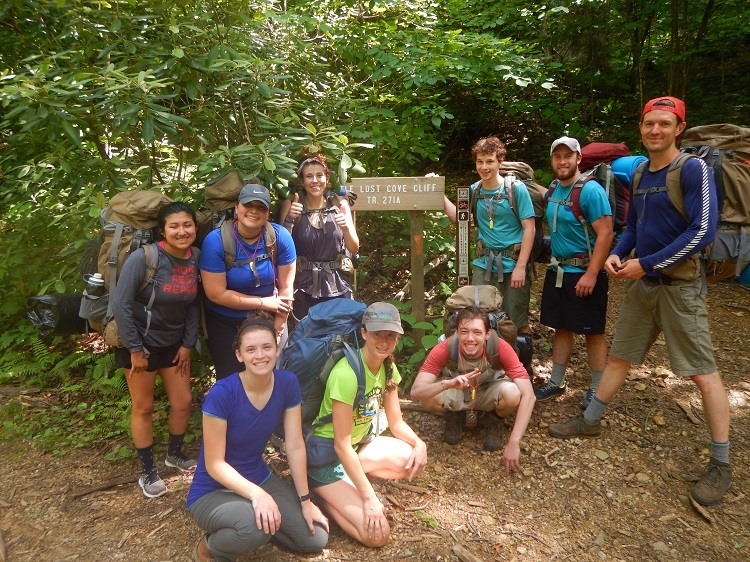 Ana, a rising senior at East Henderson High School, found out about Conserving Carolina’s Summer of Service through AIM Cub—a group that helps students from immigrant families prepare for college, including community service. 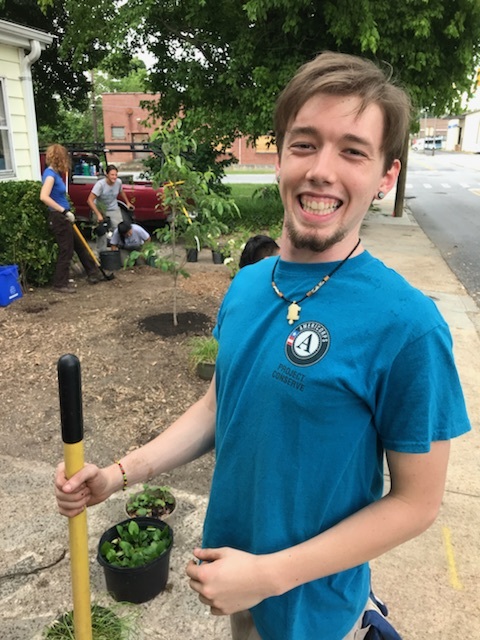 Summer of Service is a local AmeriCorps program for 17-19 year olds. Participants work on conservation projects, from improving trails to building a nature playground, while exploring personal growth and career directions. Ana knew the program would help build her resume for college. It paid. It came with an education award. And she’d be working outdoors, in nature. But she didn’t go for it. “I was shy,” she says. That made the small group structure intimidating. She wouldn’t be able to hang back, unnoticed, and let other people talk. She let the deadline pass. But, her friend, Alexla Perez-Sanchez insisted. Alexla was joining the program and she convinced Ana to contact the program director, Tony Beurskens, and apply after all. Jordan Kirkland used to spend his free time indoors, playing video games or watching TV. Until he was eight, he was an only child. “And I lived with my grandparents, so I was really spoiled,” he says, with a smile. Last year, as he was about to graduate from North Henderson High School, he reached out to Conserving Carolina about a senior project. Afterward, his project advisor suggested he join Summer of Service. Jordan signed up for a second Summer of Service term this year. 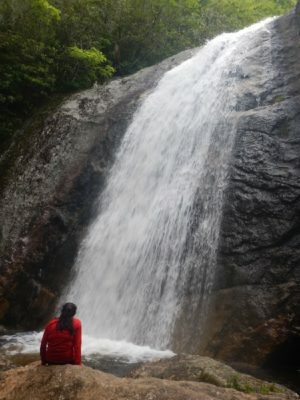 The program started in June, with six participants. They came from different high schools; one was a home schooler; some had graduated; and one was in community college. Three were Latino, three white. Three were women, three men. Most of them didn’t know each other. “It was very quiet and awkward,” Ana says. Eating lunch the first day, there were long silences. Then, they went on a three-day backpacking trip. 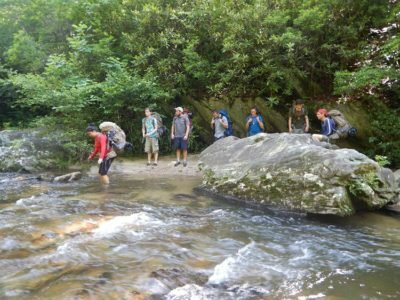 The teenagers walked 15 miles with heavy packs, in the heat and humidity. Jordan got sand in his shoes that rubbed his feet raw. They missed a turn and had to backtrack a mile, uphill. And they loved it. After the trip, Jordan and Ana say, everyone felt like friends. “We’re getting to be pretty tight,” Jordan says. 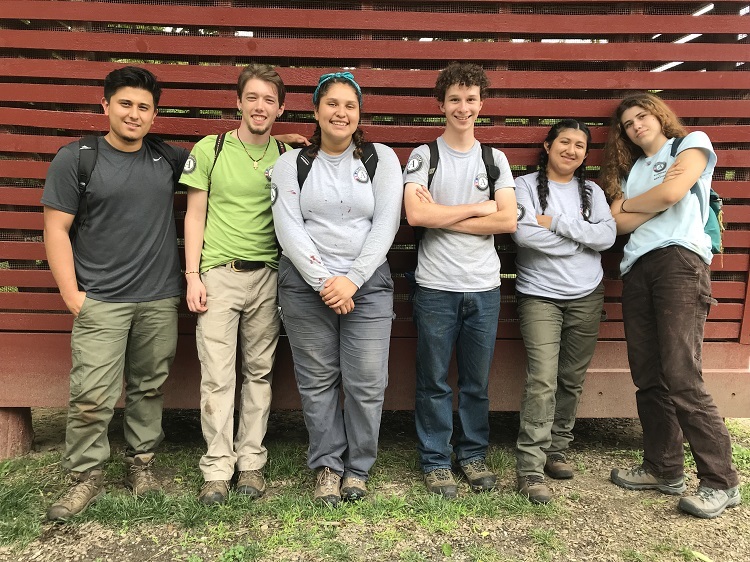 You might find the Summer of Service crew knee-deep in a bog one day, splattering mud as they pull out cattails. The next day, they’re treating hemlock trees to save them from woolly adelgids. Or they’re working in town, turning the front yard of El Centro into a pollinator garden. On other days, they’re learning life skills like mindfulness—being present with your experience, however it feels. Jordan says that much of the program can be tied together by a piece of advice that Tony, the program director, shared: Be willing to tolerate discomfort for the sake of growth. He’s gaining a sense of independence, too, including his determination to follow his ideal career path, doing hands-on stewardship of natural resources. Ana found her voice. “I learned how to introduce myself and keep a conversation going,” she says. “Before, when it came to introducing myself, I didn’t know what I should say, I didn’t know if I should shake their hand. Now I feel like it’s such a habit.” She feels confident now that she can present herself well in a college interview or a job interview. This article was published in the Hendersonville Times-News as part of our monthly Stories of the Land series.